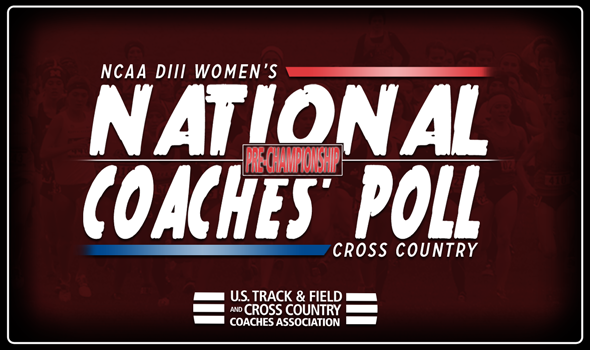 NEW ORLEANS – The only constant in the NCAA Division III Women’s Cross Country National Coaches’ Poll this season was Johns Hopkins at the top. Everything else was subject to change and Regional Championship Weekend proved just that. Once again the Blue Jays are the unanimous No. 1, but the top-5 shifted around them for the ninth week in a row. MIT and SUNY Geneseo are still No. 2 and No. 3, respectively, yet the No. 4 and No. 5 teams from last week are nowhere to be seen. Instead of Williams and Wheaton (Ill.), UW-Eau Claire and Claremont-Mudd-Scripps take their place. The Blugolds were the surprising team champions at the Midwest Region as they upset Washington (Mo. ), UW-La Crosse and the aforementioned Thunder. UW-Eau Claire put four runners in the top-15. This is the highest the Blugolds have been ranked in a season’s final poll since 2009 when they were second. The Athenas cruised to the team title in the West Region and own the fifth spot in the poll for the second time this season. Claremont-Mudd-Scripps hasn’t been ranked this high, this late in the season since 2012. Both Carleton and Tufts turned in remarkable performances at their respective regional championships and sit in a tie for seventh. The former won the Central Region, while the latter finished a game runner-up to MIT in the New England Region. Ithaca jumped eight spots from No. 24 to No. 16 after finishing runner-up to SUNY Geneseo in the Atlantic Region. The Bombers got another dominant individual win from Taryn Cordani (19 seconds) and put two more in the top-15 to punch their ticket to NCAAs. Calvin returned to the poll after falling out of it in Week 6 and Week 7. The Knights come in at No. 20 following a runner-up finish in the Great Lakes Region. RPI climbed nine spots from No. 30 to No. 21 after it finished third in the Atlantic Region. The Engineers were 21 points out of second place. You may notice that there are only 32 teams in this poll, compared to the usual 35. That’s because we only rank those teams that will compete for the national title in the final index. The 2017 NCAA Division III Cross Country Championships will be held this Saturday, November 18 in Elsah, Illinois.